With all of the shows, musical performances, and holiday events happening all over town in December, it is tough to choose what to go see and it is simply impossible to see everything. However, there are a few holiday traditions in New York that are easy to schedule and don’t even require a ticket to visit. One such tradition is the lighting of the Rockefeller Center Christmas Tree. The tree lighting has been a nationally televised event for years and has drawn people from all over the world. According to the Rockefeller Center, this tradition was started in December 1931 when a team of demolition workers at the Rockefeller Center construction site pooled their money together to buy a Christmas tree. It was a mere 20 feet high, nothing compared to the 67-100 feet high trees used today, but during the depression, this tree embodied the hope and determination of an impoverished people. Two years later, after the opening of the Rockefeller Plaza in 1933, the lighting of the tree became an official holiday ceremony. In following years, multiple trees were erected within a holiday season to commemorate specific events. For example, in 1936, to commemorate the opening of the Rockefeller Center skating rink, two trees were erected and lit for the ceremony. In 1942, to commemorate the war effort, three trees were erected trimmed in red, white, and blue. And in 1945, six ultraviolet light projectors were used to make the tree that year considerably brighter to make up for the years during the war when the tree couldn’t be lit. In 1951, the tree lighting became nationally televised on NBC as part of The Kate Smith Show. Following years saw other hosts like Howdy Doody from 1953-1955, Barbara Walters, Bob Hope, Lily Tomlin, and Liza Minnelli. The tree selected each year comes from different places all over the United States. It has been adorned with everything from tin cans and scrap paper, to aluminum and lights of every size and shape. And every year, there is a new star to bring the ceremony to light. Although the ceremony begins on December 3rd, you can still see the tree lit every evening until January 6th. 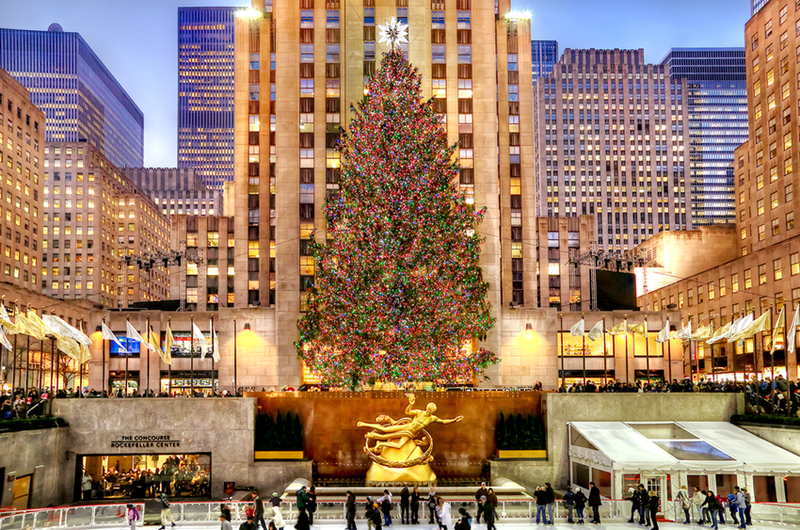 So make a trip to the Rockefeller Center, see the tree lighting that has become a national event year after year, and make sure to book your parking early with ParkJockey! We have locations near Rockefeller Center in Midtown, as well as the Upper East Side, NoHo, and all throughout New York City. Wherever you need to go, ParkJockey has you covered! Sign up now and use the promo code “TREES”, and new users will receive a discount on your next booking. But act quickly, just as the holiday tree will have to come down, so will this promotion! This entry was posted in Chicago, Miami, New York, ParkJockey, PlumValet and tagged Barbara Walters, Bob Hope, ceremony, christmas, December, Howdy Doody, Kate Smith, lights, Lily Tomlin, Liza Minnelli, midtown, parking, parkjockey, rockefeller, Time, tradition, tree on December 12, 2014 by ParkJockey Team.